Perennial (615/615). Rhizomes absent (547), or short (50), or elongated (36). 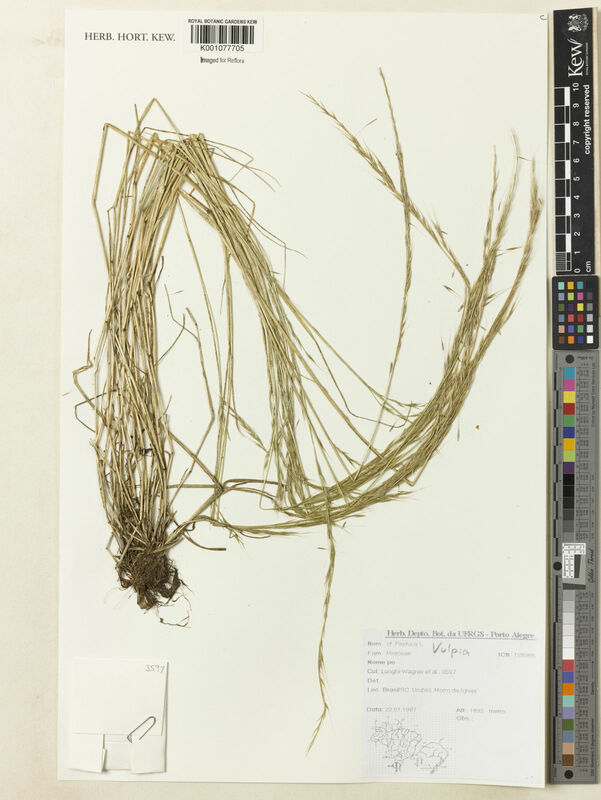 Stolons absent (614), or present (10). Culms erect (288/316), or geniculately ascending (55/316), or decumbent (4/316); robust (19/86), or of moderate stature (31/86), or slender (42/86); 2.5-49.14-260 cm long; firm (618), or wiry (3); without nodal roots (55/56), or rooting from lower nodes (1/56). Culm-internodes terete (75/76), or channelled (1/76). Culm-nodes constricted (5/6), or swollen (1/6). Lateral branches lacking (195/197), or ample (2/197). Leaf-sheaths open for most of their length (280/418), or tubular for much of their length (141/418). Leaf-sheath auricles absent (494), or erect (122), or falcate (7). Ligule an eciliate membrane (463), or a ciliolate membrane (157), or a ciliate membrane (1), or absent (3). Leaf-blades persistent (610), or deciduous at the ligule (11); aciculate (12), or filiform (373), or linear (240); herbaceous (572), or coriaceous (49); stiff (132), or firm (480), or flaccid (30); without exudate (564), or pruinose (65). Leaf-blade midrib indistinct (41/59), or evident (24/59), or conspicuous (5/59). Leaf-blade venation without cross veins (619), or with obscure cross veins (2). Leaf-blade surface with rounded ribs (3/4), or rectangular ribs (1/4). Leaf-blade margins cartilaginous (1/1). Leaf-blade apex muticous (580), or pungent (44). Bisexual (610), or monoecious (2), or dioecious (9). Inflorescence a panicle, or comprising only a few spikelets (1); subtended by an unspecialized leaf-sheath (620), or an inflated leaf-sheath (1); exserted (618), or embraced at base by subtending leaf (3). Panicle open (482/619), or contracted (154/619), or spiciform (6/619). Primary panicle branches not whorled (619), or whorled at most nodes (2). Spikelets appressed (5/6), or ascending (1/6); solitary (614/615), or in pairs (1/615). Fertile spikelets pedicelled (615/615). Pedicels filiform (3/3); tip rectangular (5/13), or widened (9/13). Male inflorescence similar to female (11/11); a panicle (3/3). Male spikelets resembling female (11/11). Spikelets comprising 0-4-13 fertile florets; with a barren rhachilla extension (11/620), or with diminished florets at the apex (612/620). Spikelets linear (3/617), or lanceolate (109/617), or elliptic (152/617), or oblong (406/617), or ovate (62/617), or obovate (8/617), or rhomboid (1/617), or cuneate (11/617); laterally compressed (618), or subterete (3); 3-9.199-40 mm long; falling entire (2), or breaking up at maturity (619); disarticulating below each fertile floret (619/619), or above glumes but not between florets (1/619). Spikelet callus glabrous (54/58), or pubescent (1/58), or pilose (3/58). Rhachilla internodes glabrous (574/620), or sparsely hairy (9/620), or pubescent (37/620), or pilose (6/620). Floret callus brief (620), or elongated (1); glabrous (67/80), or sparsely hairy (3/80), or pubescent (7/80), or pilose (5/80). Glumes persistent (619/619); shorter than spikelet (614/616), or reaching apex of florets (3/616), or exceeding apex of florets (1/616); thinner than fertile lemma (10), or similar to fertile lemma in texture (611); parallel to lemmas (620), or gaping (1). Lower glume subulate (5/616), or linear (52/616), or lanceolate (539/616), or elliptic (10/616), or oblong (13/616), or ovate (14/616), or obovate (1/616); 0.33-0.752-9 length of upper glume; hyaline (14/616), or membranous (74/616), or chartaceous (520/616), or herbaceous (10/616), or scarious (14/616), or cartilaginous (1/616), or coriaceous (17/616); without keels (597/611), or 1-keeled (16/611); 1 -veined (596/613), or 2 -veined (15/613), or 3 -veined (31/613), or 4-5 -veined (1/613). Lower glume lateral veins absent (583), or obscure (6), or distinct (42); without ribs (47/48), or ribbed (1/48). Lower glume surface smooth (553), or asperulous (40), or scabrous (43); glabrous (608), or puberulous (9), or pubescent (6), or pilose (4). Lower glume apex truncate (2/614), or obtuse (27/614), or acute (536/614), or acuminate (71/614), or attenuate (4/614), or setaceously attenuate (3/614); muticous (612/614), or mucronate (2/614), or awned (1/614). Upper glume linear (29/616), or lanceolate (501/616), or elliptic (24/616), or oblong (57/616), or ovate (80/616), or obovate (3/616); 0.33-0.8138-8.5 length of adjacent fertile lemma; hyaline (7/616), or membranous (55/616), or chartaceous (531/616), or herbaceous (2/616), or scarious (14/616), or coriaceous (13/616); with undifferentiated margins (559), or hyaline margins (15), or membranous margins (12), or scarious margins (35); without keels (600/616), or 1-keeled (16/616); 1 -veined (18/604), or 2 -veined (7/604), or 3 -veined (589/604), or 4 -veined (10/604), or 5 -veined (13/604). Upper glume lateral veins without ribs (609/610), or ribbed (1/610). Upper glume surface smooth (541), or asperulous (44), or scabrous (53); glabrous (606), or puberulous (12), or pubescent (9), or pilose (4). Upper glume apex entire, or dentate (1); 3 -fid (1/1); emarginate (1/613), or truncate (2/613), or obtuse (57/613), or acute (417/613), or acuminate (159/613), or attenuate (5/613), or setaceously attenuate (3/613); muticous (610/616), or mucronate (5/616), or awned (3/616); 1 -awned (3/3). Fertile florets bisexual (612), or female (9). Fertile lemma linear (7/616), or lanceolate (327/616), or elliptic (74/616), or oblong (192/616), or ovate (52/616), or orbicular (1/616); membranous (41/616), or chartaceous (563/616), or herbaceous (4/616), or scarious (4/616), or coriaceous (10/616); of similar consistency above (610), or much thinner above (11); of similar consistency on margins (593), or much thinner on margins (28); without keel (591/612), or keeled (21/612); 1-2 -veined (1/613), or 3 -veined (16/613), or 4 -veined (10/613), or 5 -veined (605/613), or 6-7 -veined (4/613). Lemma midvein without distinctive roughness (594), or scaberulous (6), or scabrous (22); eciliate (620), or ciliolate (1). Lemma lateral veins obscure (37/63), or with distinct primaries but obscure intermediates (7/63), or distinct (7/63), or prominent (12/63). Lemma surface smooth (369), or granulose (2), or asperulous (22), or scaberulous (132), or scabrous (132), or papillose (5), or punctate (1); glabrous (572), or puberulous (33), or pubescent (37), or pilose (6), or hispidulous (1), or hispid (2). Lemma margins flat (620), or involute (1); eciliate (597), or ciliolate (12), or ciliate (23), or pubescent (2). Lemma apex entire (596), or erose (4), or dentate (27); 2 -fid (25/27), or 3 -fid (2/27), or 4 -fid (1/27); emarginate (12/569), or obtuse (18/569), or acute (330/569), or acuminate (211/569), or attenuate (14/569), or setaceously attenuate (9/569), or cuspidate (2/569); without ornament (616), or scabrous (4), or pubescent (1); muticous (206), or pungent (1), or mucronate (105), or awned (454); 0 -awned (1/452), or 1 -awned (452/452). Principal lemma awn apical (476/505), or subapical (11/505), or from a sinus (19/505); straight (500/505), or curved (1/505), or flexuous (7/505); 0.1-0.7741-19 length of lemma. Palea 0.6-1.018-2 length of lemma; 2 -veined (578/578). Palea keels smooth (356), or scaberulous (107), or scabrous (164); eciliate (560), or puberulous (1), or pubescent (4), or ciliolate (50), or ciliate (8). Palea surface glabrous (571), or puberulous (20), or pubescent (21), or pilose (9). Palea apex entire (3/69), or erose (1/69), or dentate (65/69); muticous (620), or awned (1). Apical sterile florets resembling fertile though underdeveloped (597/612), or distinct from fertile (15/612); 1 in number (2/2); barren (4/4); rudimentary (1/5), or linear (1/5), or lanceolate (3/5). Apical sterile lemmas muticous (13/15), or mucronate (2/15), or awned (2/15). Lodicules 1 (1/112), or 2 (111/112); membranous (18/18); glabrous (109/112), or ciliate (5/112); entire (3/15), or with a small lateral lobe (3/15), or 2-toothed (11/15), or irregularly toothed (1/15). Anthers 3 (598/598). Ovary glabrous (251/398), or with a few apical hairs (28/398), or pubescent on apex (131/398). Caryopsis with adherent pericarp (578/578); linear (5/165), or lanceolate (15/165), or fusiform (3/165), or ellipsoid (103/165), or oblong (15/165), or ovoid (2/165), or obovoid (29/165), or oblanceolate (1/165); dorsally compressed (1/1); plano-convex (1/2), or concavo-convex (1/2). Embryo 0.1-0.1958-0.33 length of caryopsis. Hilum punctiform (2/564), or linear (562/564); 0.4-0.7649-1 length of caryopsis. Male inflorescence similar to female (11/11); a panicle (3/3). Male spikelets resembling female (11/11). Europe (192), or Africa (67), or Temperate Asia (158), or Tropical Asia (49), or Australasia (19), or Pacific (8), or North America (62), or South America (163), or Antarctica (5). Spikelets several–many-flowered, ± laterally compressed; glumes subequal, narrow, the lower 1(–3)-nerved, the upper 3-nerved; lemmas ± lanceolate, rounded on the back, herbaceous or somewhat indurated, (3–)5-nerved, with an awn or awn-point from the tip, less often awnless or awned from just below the tip; ovary glabrous, or sometimes pubescent above, the styles apical. Spikelets several-many-flowered, laterally compressed, pedicelled, solitary; rhachilla slender, slightly elongated, disarticulating above the glumes and between the florets. Florets clearly exserted from the glumes, hermaphrodite but the uppermost one usually reduced; callus small, annular, usually glabrous. Glumes subequal, sometimes the inferior smaller, herbaceous to subcoriaceous, keeled; the inferior 1-3-nerved; the superior 3-nerved. Lemmas lanceolate, (3-)5-(7)nerved, herbaceous to subcoriaceous, dorsally rounded or rarely somewhat keeled towards the apex, usually awned or with an awn-point from the apex, rarely awnless or awned dorsally from below the apex. Paleas as long as or slightly shorter than the corresponding lemmas, 2-keeled, usually with the apex 2-dentate, thinly membranous or hyaline, with the keels scaberulous or ciliolate. Lodicules 2, entire or asymmetrically 2-lobed. Ovary glabrous or sometimes with the apex pubescent; styles 2, laterally exserted. Caryopsis usually elongate, usually free but tightly enclosed by the lemma and the palea, dorsally compressed and grooved; embryo small, not reaching 1/3 the length of the caryopsis; hilum basal. Leaf-laminae folded or convolute, often setaceous, rarely expanded. Ligule scarious or sometimes membranous, usually entire. Inflorescence an open or contracted panicle. Annual. Culms erect; 20-57.5-100 cm long. Ligule an eciliate membrane. Inflorescence composed of racemes. Racemes single; bilateral. Rhachis flattened. Spikelet packing broadside to rhachis; lax. Spikelets appressed; solitary. Fertile spikelets pedicelled. Pedicels oblong. Spikelets comprising 3-9 fertile florets (1), or 10-14 fertile florets, or 15-16 fertile florets (1); with diminished florets at the apex. Spikelets oblong; laterally compressed; 3-11.5-20 mm long; breaking up at maturity; disarticulating below each fertile floret. Glumes persistent; shorter than spikelet. Lower glume oblong; 0.7-0.825-1 length of upper glume; coriaceous; without keels; 1-3 -veined. Lower glume lateral veins ribbed. Lower glume apex obtuse, or acute. Upper glume oblong; 0.7-0.875-1 length of adjacent fertile lemma; coriaceous; without keels; 3-5 -veined. Upper glume lateral veins ribbed. Upper glume apex acute. Fertile lemma elliptic; coriaceous; without keel; 5 -veined. Lemma surface smooth (1), or scaberulous (1). Lemma apex obtuse; muticous, or awned (1); 1 -awned (1/1). Palea 1 length of lemma; 2 -veined. Palea keels scabrous. Apical sterile florets resembling fertile though underdeveloped. Europe, or Africa (1), or Temperate Asia (1). Annual. Culms erect; 20-40 cm long. Ligule an eciliate membrane. Inflorescence composed of racemes. Racemes single; unilateral. Rhachis subcylindrical and excavated. Spikelet packing broadside to rhachis; distant; 2 -rowed. Spikelets sunken; solitary. Fertile spikelets sessile. Spikelets comprising 4-6 fertile florets; with a barren rhachilla extension. Spikelets oblong; laterally compressed; 2.2-7 mm long; breaking up at maturity; disarticulating below each fertile floret. Glumes collateral; persistent; shorter than spikelet; firmer than fertile lemma. Lower glume oblong; 0.8 length of upper glume; coriaceous; 1-keeled; 1-5 -veined. Lower glume apex emarginate. Upper glume oblong; 0.8 length of adjacent fertile lemma; coriaceous; 1-keeled; 5 -veined. Upper glume apex emarginate. Fertile lemma elliptic; chartaceous; without keel; 5 -veined. Lemma apex entire, or dentate; 2 -fid; emarginate; muticous, or mucronate. Caryopsis with adherent pericarp; ellipsoid. Hilum punctiform. Europe, or Africa, or Temperate Asia. Annual (24), or perennial (2). Culms erect (18/20), or geniculately ascending (10/20), or decumbent (9/20); slender (1/1); 3-27-115 cm long. Ligule an eciliate membrane. Leaf-blades filiform (6), or linear (20); firm, or flaccid (5). Inflorescence a panicle (20), or composed of racemes (8); exserted (25), or embraced at base by subtending leaf (5). Panicle open (6/20), or contracted (15/20), or spiciform (1/20). Panicle axis bearing persistent branches (19/20), or deciduous spikelet clusters (1/20). Racemes single (8/8); linear (6/8), or oblong (2/8), or ovate (2/8); unilateral (7/7). Rhachis angular (1/2), or semiterete (1/2). Spikelet packing broadside to rhachis (2/2); 2 -rowed (1/1). Spikelets appressed (1/4), or pectinate (3/4); solitary (25), or in pairs (1), or in threes (1). Fertile spikelets sessile (1), or pedicelled (25); 3 in the cluster (1/1). Pedicels free (24/25), or fused to each other (1/25); linear (5/19), or oblong (10/19), or clavate (4/19), or cuneate (1/19); tip rectangular (2/4), or widened (2/4). Spikelets comprising 1-4-17 fertile florets; with diminished florets at the apex. Spikelets oblong (17), or obovate (2), or cuneate (23); laterally compressed; 1-8.682-21 mm long; falling entire (2), or breaking up at maturity (25); deciduous with the pedicel (1/2), or in a cluster with fused pedicels (1/2); disarticulating below each fertile floret (25/25). Floret callus brief (24), or evident (1), or elongated (1); glabrous (5/8), or pubescent (2/8), or pilose (1/8); obtuse (23), or acute (2), or pungent (1). 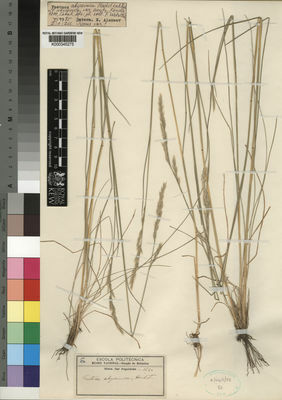 Glumes persistent (25/25); shorter than spikelet; thinner than fertile lemma (18), or similar to fertile lemma in texture (7), or firmer than fertile lemma (1); parallel to lemmas (25), or gaping (1). Lower glume linear (15), or lanceolate (8), or oblong (2), or ovate (7); 0.02-0.3723-0.8 length of upper glume; hyaline (1), or membranous (24), or chartaceous (1); without keels (17), or 1-keeled (9); 0 -veined (5), or 1 -veined (22), or 3 -veined (2). Lower glume lateral veins absent (24), or distinct (2). Lower glume surface smooth (25), or scabrous (2); glabrous, or pubescent (2). Lower glume apex obtuse (3/25), or acute (17/25), or acuminate (5/25), or attenuate (2/25); muticous (25), or mucronate (1), or awned (1). 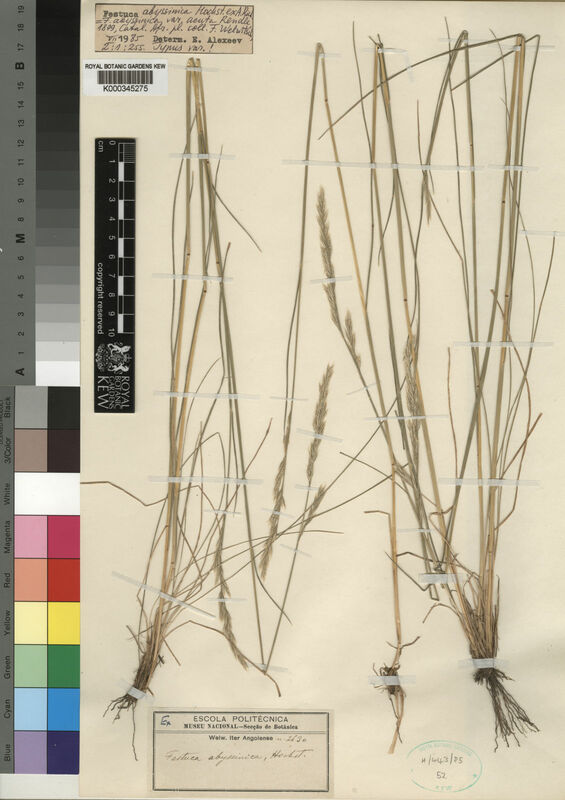 Upper glume linear (5), or lanceolate (23), or oblong (1); 0.3-0.8935-1.5 length of adjacent fertile lemma; membranous (19), or chartaceous (4), or coriaceous (3); with undifferentiated margins (24), or membranous margins (2); without keels (14), or 1-keeled (12); 1 -veined (8/25), or 2 -veined (4/25), or 3 -veined (21/25), or 4-5 -veined (1/25). Upper glume lateral veins without ribs (22/23), or ribbed (1/23). Upper glume surface smooth (23), or scabrous (3); glabrous, or pubescent (2). Upper glume apex obtuse (3), or acute (7), or acuminate (11), or attenuate (7); muticous (16), or mucronate (1), or awned (10); 1 -awned (10/10). Fertile lemma lanceolate (24), or elliptic (1), or ovate (1); membranous (4), or chartaceous (21), or coriaceous (1); without keel (22), or keeled (4); 3-4 -veined (2), or 5 -veined. Lemma midvein without distinctive roughness, or scaberulous (1). Lemma lateral veins obscure (2/2). Lemma surface smooth (18), or asperulous (2), or scaberulous (6), or scabrous (4); glabrous (24), or pubescent (10). Lemma margins eciliate, or ciliate (1). Lemma apex acute (2), or acuminate (14), or attenuate (10); muticous (2), or mucronate (1), or awned (25); 1 -awned (25/25). Principal lemma awn 0.9-1.75-3 length of lemma. Palea 0.6-0.9594-1 length of lemma; 2 -veined (22/22). Palea keels smooth (14), or scaberulous (7), or scabrous (5); eciliate (25), or ciliolate (1). Palea apex dentate (3/3); muticous (24), or with excurrent keel veins (1), or awned (1). Apical sterile florets resembling fertile though underdeveloped (21), or distinct from fertile (7); 0-1 in number (2/7), or 2 in number (4/7), or 3 in number (6/7), or 4 in number (3/7), or 5-8 in number (1/7); barren (5/5); separate (3/7), or in a clump (4/7); linear (4/5), or lanceolate (1/5). Apical sterile lemmas muticous (2/7), or awned (5/7). Lodicules 2 (1/1). Anthers 1 (13/24), or 2 (7/24), or 3 (17/24). Ovary glabrous (16/21), or pubescent on apex (5/21). Caryopsis with adherent pericarp (24/24); linear (16/18), or fusiform (2/18); dorsally compressed (1/1). Embryo 0.1-0.1875-0.2 length of caryopsis. Hilum elliptic (1/19), or linear (18/19); 0.33-0.749-1 length of caryopsis. Europe (15), or Africa (16), or Temperate Asia (13), or Tropical Asia (6), or Australasia (6), or Pacific (2), or North America (5), or South America (6), or Antarctica (2). Spikelets 3–13-flowered, laterally compressed, borne upon short thickened pedicels; glumes often very unequal, narrow, the lower nerveless or 1-nerved, the upper 1–3-nerved, longer than the lower; lemmas subulate-lanceolate, rounded on the back with incurved margins, finely 5-nerved, becoming rigid, narrowed into a fine straight awn; paleas 2-keeled, narrow; stamens 1–3. Annual. Culms erect; 20-40 cm long. Ligule an eciliate membrane. Leaf-blades filiform. Inflorescence composed of racemes. Racemes single; unilateral. Rhachis fragile at the nodes; subcylindrical and excavated. Spikelet packing broadside to rhachis; distant. Spikelets sunken; solitary. Fertile spikelets sessile. Spikelets comprising 1 fertile florets; with a barren rhachilla extension, or with diminished florets at the apex. Spikelets linear; laterally compressed; 3.5-5 mm long; breaking up at maturity; disarticulating below each fertile floret. Glumes one the lower absent or obscure; lateral; persistent; shorter than spikelet; thinner than fertile lemma. Upper glume ovate; 0.1-0.25 length of adjacent fertile lemma; membranous; without keels; 1 -veined. Upper glume apex acute. Fertile lemma lanceolate; coriaceous; keeled; 3 -veined. Lemma apex acuminate; awned; 1 -awned. Apical sterile florets resembling fertile though underdeveloped. Caryopsis with adherent pericarp; lanceolate. Hilum linear; 0.33-0.66 length of caryopsis. Europe, or Africa, or Temperate Asia, or Tropical Asia, or Australasia. Perennial. Culms 6-30 cm long. Ligule an eciliate membrane. Leaf-blades filiform. Inflorescence a panicle; embraced at base by subtending leaf. Panicle contracted. Spikelets solitary. Fertile spikelets pedicelled. Pedicels filiform; tip pyriform. Spikelets comprising 2-3 fertile florets; with diminished florets at the apex. Spikelets oblong; laterally compressed; 10-20 mm long; breaking up at maturity; disarticulating above glumes but not between florets. Glumes persistent; shorter than spikelet. Lower glume lanceolate; 0.8 length of upper glume; membranous; 1-keeled; 1 -veined. Lower glume lateral veins absent. Lower glume apex acuminate. Upper glume lanceolate; 0.8-1 length of adjacent fertile lemma; membranous; 1-keeled; 1 -veined. Upper glume apex acuminate. Fertile lemma lanceolate; membranous; keeled; 5 -veined. Lemma surface scaberulous. Lemma apex lobed; 2 -fid; incised 0.2 of lemma length; awned; 1 -awned. Principal lemma awn dorsal. Palea gaping; 2 -veined. Palea keels scaberulous. Apical sterile florets 4-7 in number; barren; linear. Apical sterile lemmas awned. Caryopsis with adherent pericarp; lanceolate; dorsally compressed. Embryo 0.15 length of caryopsis. Hilum linear; 0.66 length of caryopsis. Annual (7), or perennial (1). Stolons absent (7), or present (1). Culms erect (5/6), or geniculately ascending (4/6), or decumbent (1/6); 3-23.25-65 cm long. Ligule a ciliolate membrane (1), or a fringe of hairs (7). Leaf-blades stiff (2), or firm (6). Leaf-blade margins cartilaginous (3/3). Inflorescence composed of racemes; subtended by an unspecialized leaf-sheath (7), or an inflated leaf-sheath (1). Racemes borne along a central axis; not compacted (1), or in a multilateral false spike (7); spreading; oblong (5), or cuneate (3); bearing few fertile spikelets; bearing 1 fertile spikelets on each (1), or 2 fertile spikelets on each, or 3-4 fertile spikelets on each (4), or 5 fertile spikelets on each (2). Rhachis evident (5), or obsolete (3); deciduous from axis; subterete (5/5); terminating in a spikelet (1/5), or barren extension (4/5); extension subulate (3/4), or bristle-like (1/4). Raceme-bases brief (2), or filiform (2), or linear (4). Spikelets solitary (4), or in pairs (4). Fertile spikelets sessile (7), or pedicelled (1); 2 in the cluster (3/3); subequal (1/4), or the upper smaller (3/4). Pedicels linear (1/1), or oblong (1/1). Spikelets comprising 1 fertile florets; without rhachilla extension. Spikelets lanceolate; subterete (6), or dorsally compressed (2); 2-4.309-10 mm long; falling entire; deciduous with accessory branch structures. Glumes one the lower absent or obscure (5), or two (5); exceeding apex of florets; firmer than fertile lemma. Lower glume lanceolate (2/5), or ovate (3/5); 0-0.12-0.2 length of upper glume; hyaline (5/5); without keels (3/3); 0 -veined (5/5). Lower glume lateral veins absent (3/5), or distinct (2/5). Lower glume apex acute (3/3). Upper glume lanceolate (1), or elliptic (2), or ovate (5); 1-1.162-1.5 length of adjacent fertile lemma; membranous; without keels; 5 -veined (5), or 7 -veined (3). Upper glume lateral veins ribbed. Upper glume surface smooth (1), or spinose (1), or with hooked spines (6); glabrous (7), or puberulous (1), or setose (1); with simple hairs (1/2), or tubercle-based hairs (1/2). Upper glume apex acute (5), or acuminate (3). Fertile lemma lanceolate (1), or elliptic (2), or ovate (5); dorsally compressed (6/6); hyaline (2), or membranous (6); without keel; 3 -veined. Lemma surface glabrous (5), or puberulous (4). Lemma apex acuminate; muticous, or mucronate (1). Palea 1 length of lemma; hyaline (1), or membranous (7); 2 -veined. Palea apex erose (1/1). Caryopsis with adherent pericarp; ellipsoid (6/6); dorsally compressed (6/6); biconvex (5/5). Embryo 0.5 length of caryopsis. Hilum punctiform (1/1). Europe (1), or Africa (6), or Temperate Asia (3), or Tropical Asia (2), or Australasia (2), or Pacific (2), or North America (2), or South America (4). Amsterdam-St.Paul Is, Antipodean Is., Ascension, Bahamas, Crozet Is., Desventurados Is., Dominican Republic, Easter Is., El Salvador, Haiti, Jamaica, Juan Fernández Is., Kermadec Is., Leeward Is., Marion-Prince Edward, Mauritius, Norfolk Is., Northern Territory, Puerto Rico, Queensland, St.Helena, Tristan da Cunha, Tubuai Is., Vietnam, Western Australia, Windward Is. Festuca achtarovii Velchev & P.Vassil. Festuca australis Nees ex Steud. 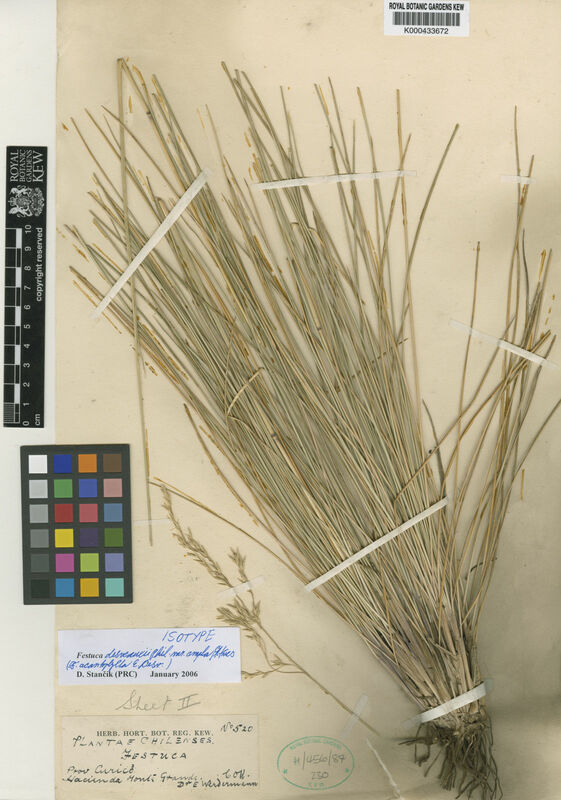 Festuca brevis (Boiss. & Kotschy) Asch., Schweinf. & Muschl. Festuca capillifolia Dufour ex Roem. & Schult. Festuca cataonica (Hack. ex Boiss.) Markgr.-Dann. Festuca caucasica (Boiss.) Hack. ex Boiss. Festuca cretacea T.I.Popov ex Proskor. Festuca cyllenica Boiss. & Heldr. 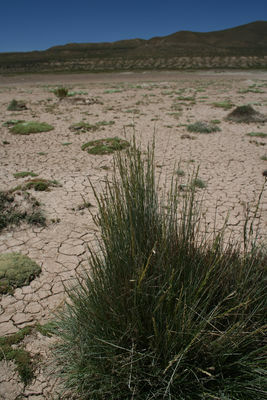 Festuca deserti (Coss. & Durieu) Trab. Festuca dissitiflora Steud. ex Griseb. Festuca dolichantha Keng ex Keng f.
Festuca edlundiae S.G.Aiken, Consaul & Lefk. Festuca floribunda (Pilg.) P.M.Peterson, Soreng & Romasch. Festuca francoi Fern.Prieto, C.Aguiar, E.Días & M.I.Gut. 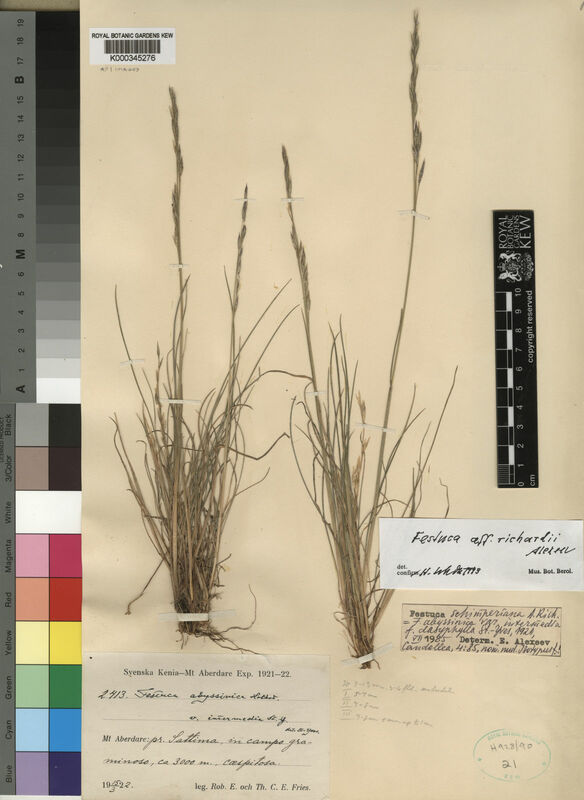 Festuca galicicae Horvat ex Markgr.-Dann. Festuca geniculata (L.) Lag. & Rodr. Festuca glacialis (Miégev. ex Hack.) K.Richt. Festuca guestfalica Boenn. ex Rchb. Festuca hephaestophila Nees ex Steud. Festuca hircina Enustsch. & Prob. Festuca intercedens Lüdi ex Bech. Festuca karaginensis Enustsch. & Prob. Festuca korabensis (Jáv. ex Markgr.-Dann.) Markgr.-Dann. Festuca kozanensis Foggi & Joch.Müll. Festuca livida (Kunth) Willd. ex Spreng. Festuca longiauriculata Fuente, Ortúñez & Ferrero Lom. Festuca lugens (E.Fourn.) Hitchc. ex Hern.-Xol. Festuca macrophylla Hochst. ex A.Rich. 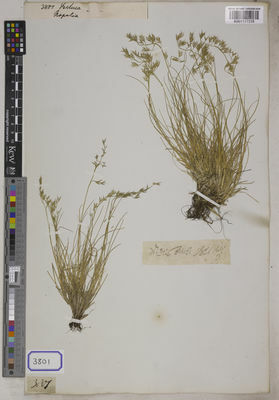 Festuca maleschevica Velchev & P.Vassil. Festuca nitida Kit. ex Schult. Festuca × pachyphylla Degen ex Nyár. Festuca petraea Guthnick ex Seub. Festuca pinifolia (Hack. ex Boiss.) Bornm. Festuca purpurascens Banks & Sol. ex Hook.f. Festuca raddei Enustsch. & Prob. Festuca riloensis (Hack. ex Hayek) Markgr.-Dann. Festuca salzmannii (Boiss.) Boiss. ex Coss. Festuca sanjappae Chandra Sek. & S.K.Srivast. Festuca setifolia Steud. ex Griseb. Festuca simensis Hochst. ex A.Rich. Festuca taurica (Hack.) A.Kern. ex Hack. Festuca tristis Krylov & Ivanitzk. Festuca uninodis Hack. ex Stuck. Festuca ustulata (Hack. ex St.-Yves) Markgr.-Dann. Festuca vettonica Fuente, Ortúñez & Ferrero Lom. Festuca willdenowiana Schult. & Schult.f. Nardurus (Bluff, Nees & Schauer) Rchb. St.-Yves in Candollea 4: 65 (1929). Gen. Pl. ed. 5: 33 (1754).